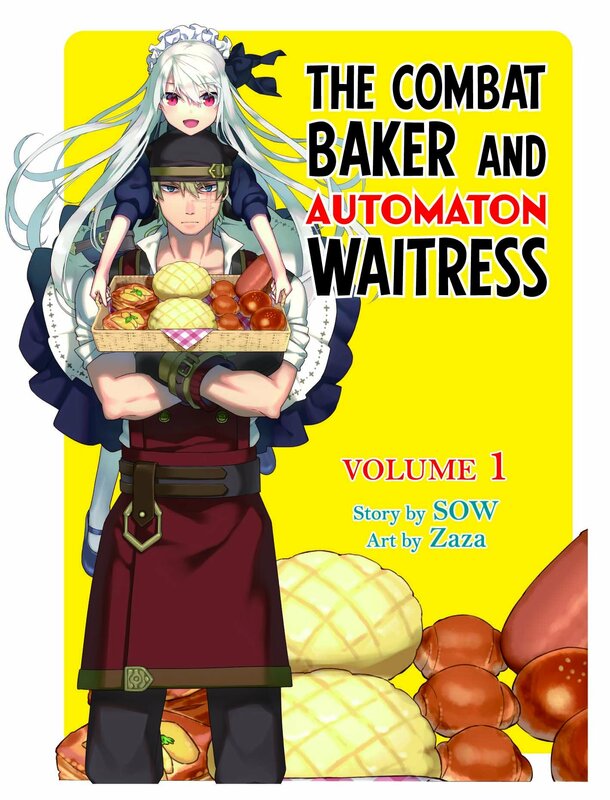 This review is for the first volume of The Combat Baker and Automaton Waitress, which is being released digitally by BookWalker Global. This series is written by SOW and features illustrations by Zaza. There are 7 volumes in Japan at the moment. Special thanks to BookWalker Global for providing a review copy of this volume. This light novel caught my eye thanks to the fun-sounding title and cover illustration. What exactly was a combat baker? Why is the waitress an automaton? Will hijinks ensue? I couldn’t help but anticipate this story a little. Also, I like melon bread. The story of this volume turned out to be much more serious than I expected. It’s not really a slice-of-life type of story about running a bakery, nor is it really focused on comedy. It’s more of a simple character drama with a helping of sci-fi action, and kind of has the feel of an anime from 15 or so years ago. There’s an earnestness to the story that’s hard not to like. The combat baker in question is Lud, who was one of the top fighters on the winning side of a war set in a fantasy World War-era Europe. His dream is to run a bakery, but the city he settles in shuns him in part because of animosity toward his homeland, and in part because of his permanent scowl that scares away potential customers. (His attempts at a friendly smile only frighten everyone.) Things finally start looking up for him though near the beginning of the volume when an enthusiastic silver-haired girl named Sven shows up to be a waitress for the bakery. What Lud doesn’t realize is that Sven is a robot–and more than that, a robot with the A.I. of Lud’s mecha unit that he fought with in the war. Their relationship is thus highly unorthodox, but it plays out in a manner that will feel familiar to most anime and manga fans. Lud and Sven are both characters who are easy to root for, and I enjoyed most of their interactions throughout the book. While they struggle to turn things around for the bakery, the main conflict of the plot is gradually dished out by a number of side characters they encounter. Though the war is over, there are still armies and organizations scheming to get the upper hand on one another–and Lud’s town becomes a point of interest for certain distant villains. The plot becomes something of a thriller for the second half, and though it’s all a bit by-the-numbers, it’s still engaging enough. I didn’t care much for the secondary characters in this volume, but it’s possible they’ll be developed more in future entries. More significantly, I felt that some of the backstory for Lud could have been handled better. It’s told in a bland manner, which is unfortunate because it’s something that could have left a strong impact. I was also bothered by a few plot holes throughout the story–namely in the form of Lud being far too dense to work anything out regarding Sven. There were just too many scenes that felt forced. My biggest issue for this volume though would have to be the text’s general lack of polish. It felt like it needed not only another round of proofreading, but another round of editing for improved sentence flow and stronger voice. Since this is a digital release, it’s possible that this has been (or will be) fixed–but regardless, I’m hoping future volumes will do better in this regard. This is a series that I think has strong potential to become something both unique and pleasant for English light novel readers, so I plan to read on to see how things fare in volume 2. But for now, I’ll say that if the premise sounds intriguing to you, feel free to give volume 1 a shot. ← The Ryuo’s Work is Never Done!